HomeDungeons and DragonsMechanics DiscussionUsing the Search Action: Investigation or Perception? We’re back at it again with another deep dive into a specific D&D 5e mechanic. This time it’s the Search action, which is a bit of an anomaly as it’s an action that I believe confuses the DM way more often than it would a player. At its core, the Search action is super basic. It’s simply devoting time to finding something. I’m paraphrasing the exact definition from page 193 of the Player’s Handbook (PHB), but only slightly. The entire definition of the action is only 2 sentences long! So where’s the confusion? That part comes with the 2nd sentence of the Search action’s definition. The DM can call for either a Wisdom (Perception) or an Intelligence (Investigation) check. It’s pretty open-ended as to which skill can be used when since they’re very similar skills at first glance. Let’s break out our magnifying glasses and cut to the chase. It’s time to dissect the Search action and learn some of the differences between Perception and Investigation! The best way to search for traps is to let the tank go first. Credit: WotC. First of all, let’s just get the combat applications out of the way. Most of these mechanics discussion articles, outside of the Help action, have all been combat-oriented. However, as I said before, the Search action is an anomaly. In the case of the Search action, we’re going to spend more of our time talking about the components of it and how to use it in general since its combat applications are super straightforward. Essentially, when you choose to take the Search action on your turn you spend your entire action trying to find something. This could be trying to find a physical object in a pile of junk, or it could be looking for a minute detail somewhere in a puzzle. You can use the Ready action to use the Search action. 9 times out of 10 there’s no reason for this, but you have the ability to do so should you so choose to. One example of it being optimal to use a Ready action to trigger a Search action would be if you are waiting for an enemy to move away from the object/location in question that you’re trying to search. Intelligence (Investigation) or Wisdom (Perception)? Now we get to the meat of the article. As the DM you’ll have a decision to make. Should the player make you an Investigation check or a Perception check as their Search action? I’ll admit that it’s not always the easiest decision in the world. It’s gotten much easier for me as of late, but part of that is because I’ve been playing and DMing 5e for years at this point. Experience comes with time, so how should a new DM go about making this call? The best way to go about this is to learn the definitions of both checks! All of the skill check and ability score definitions can be found on pages 173-178 of the PHB. If you haven’t already, I’d highly suggest reading that chapter of the book, but I’ll summarize everything for now. If you are looking for something that is not in plain sight you’re using your intelligence to make connections and deductions to uncover these hidden secrets. Whatever it is you’re looking for is not easily discerned by your senses, therefore you need to rely on your brains to find it. Investigation involves relying on your studies, street smarts, or other knowledge to find the clues, object, or information that you are looking for. If you are searching by using any or all of the 5 senses you’re trying to perceive the world around you. Perhaps you’ll find what you’re looking for by passively sensing your surroundings, or you have an extremely keen sense that will lead you towards your goal. Perception focuses on using your natural senses (sight, smell, hearing, touch, taste) to detect whatever it is you’re looking for. Patience is a virtue. Look before you leap! Credit: WotC. We already have a basic idea of which check to call for from understanding the definitions of each skill. If the player is using a Search action to find an object by relying on their senses, it’s probably a Perception check. However, if they’re looking for a hidden clue or secret door it’s more likely to be an Investigation check. That being said, there are times when either skill could find the clue you’ve hidden or the information that the player is looking for. For example, if the player says “I check the hallway for traps” they’re using the Search action. But in this case, either an Investigation or a Perception check could be used. When I’m not sure of which skill to call I typically ask the player to elaborate. For example, I’d ask “How do you search the hallway for traps?”. Most of the time they’ll give me more information such as they’re looking around for hidden traps under the floorboards (Investigation), or they’re keeping an eye out for tripwires or pitfalls (Perception). Having your players describe their actions is not only beneficial for role-playing, but it can also help you determine what checks to call for as the DM! You may use Investigation for your Search action to find something like hidden detail in a painting or mural, or it could be physically finding a hidden compartment somewhere in the wall. While you will use one of your senses such as sight or touch in those examples, your character is primarily using their deduction and reasoning skills. They’re trying to find patterns to pick out or discern information about their findings to make sense of things. If the character is searching for something that isn’t easily detectable by their senses alone, it’s an Investigation check. Instead, you might use Perception for your Search action to find something like a key hidden in a pile of trash or putting your ear to a door to hear if there are potential enemies in the next room. Your intelligence, vast though it may be, isn’t going to be much help. In these scenarios, you’re relying more on your gut intuition and senses to learn this information. Ergo, you’ll be using your Perception. If the quickest way to find what you’re looking for is by perceiving the world around you, it’s a Perception check. There are times when you don’t particularly care which skill the player uses. Both are valid options, so you’ll leave it up to them. Most of the time the player is going to choose the skill that their character is better at. There’s nothing wrong with that. However, in these instances, I like to give the player different information based on how they decide to search. If they opted to roll a Perception check, I’d tell them what they physically saw, heard, felt, etc. However, if they were more investigative I’d give them details about whatever it is they found, and perhaps an assumption of what it does. Both options have value and grant the same result, but one skill may give the players more information that they’re currently seeking. 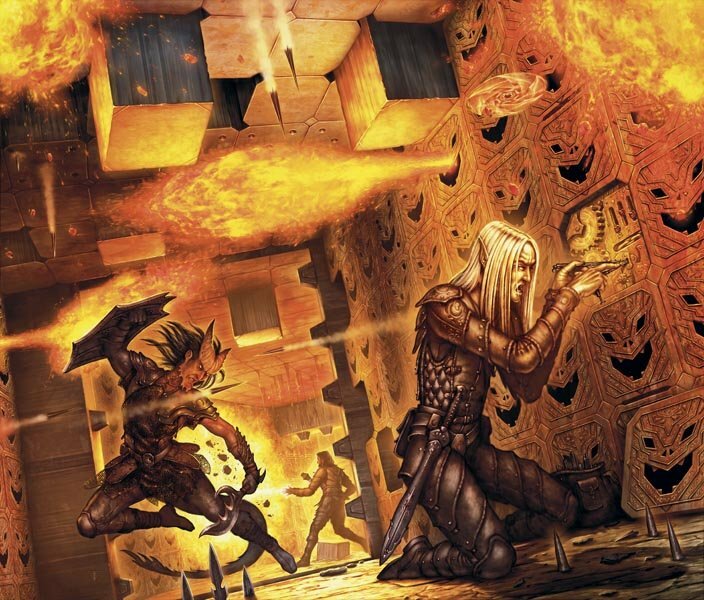 The Search action is a deceptively complex mechanic for new DMs in D&D 5e. As a player, all you have to do is use your action to search for something. However, as a DM, you have to determine which skill check to call for and determine what the character finds (or doesn’t). The difficulty in this decision comes primarily from not knowing what Investigation and Perception do. While they’re very similar, they do have some key differences that can help you make your decision. Once you understand both skills and have a bit of experience under your belt as a DM you’ll have no issue calling for one skill or the other with confidence!